Triple Pane Windows vs. Double Pane: What's Better? When shopping for new windows customers often ask whether they must get triple pane windows or double pane windows. Compared to double pane, triple pane windows not only make your home more comfortable; when installed correctly they also improve the home’s energy efficiency, keep your house warmer in the winter, cooler in the summer, and less reliant on the central air system. Let’s take a look at how the two window types compare and ways you can get the highest energy efficiency performance out of your replacement project. What are double and triple pane windows? To answer this question fully, let’s define what a pane is. A window pane, also sometimes referred to as glazing, is quite literally the sheet of glass separating the inside of your home from the outside. Double-pane and triple-pane windows come with two or three panes respectively. The introduction of additional panes in a window also led to the invention of insulated glass units (IGUs) sometimes referred to as sealed units. A sealed unit combines the multiple panes of a window with an energy efficient spacer into one. Argon and Krypton gas fills are usually used between the panes for additional efficiency. Another reason homeowners often consider triple pane windows over double pane is because of their improved noise-reduction features. Although not as good at keeping noise out as SSP glass, the extra pane is an improvement compared to the noise-reduction capabilities of double pane windows. How are triple-pane windows better than double-pane? The answer is pretty straightforward. The additional pane of glass in the window creates a better insulating barrier. Compared to double-pane units, triple-pane windows allow less heat to escape, have less condensation, and are more soundproof. Makes sense. But another benefit of triple pane windows over double is that the extra pane allows for the utilization of additional Low-E coatings. To an untrained eye, low-emissivity coatings look like a window tint or film. 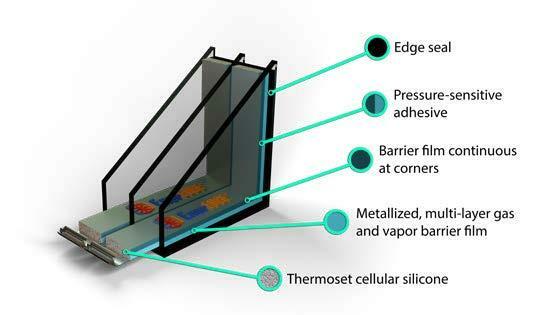 In reality, though, the coating is applied during the manufacturing of the windows and at a molecular level. Pretty much all windows manufactured in Canada today utilize low-emissivity coatings to improve the performance and efficiency of the window. This applies to both double and triple pane windows. Combined with the insulating properties of an additional pane, these features make your window even more efficient, and your home more comfortable. Note: ER values shown represent the lowest and highest of two glazing options. In all cases Silicone Foam has been used. Double glazing or triple glazing with alternative option of Argon 90% and Krypton 90% have been used. In all cases LowE is applied on surface(s) 2 for double glazing options and triple glazing either surface(s) 2 or 2 and 5 were applied. In most of these windows, the addition of an extra pane of glass and an extra coating of Low-E allows for a one-third increase in Energy Ratings and performance. With the recent changes to Energy Star ratings and the introduction of NAFS compliance to the Canadian windows market, customers in places like Calgary, Winnipeg and Regina will find that the minimum acceptable ER ratings have risen from 25 to 29 and some double-pane windows no longer qualify without the additional energy-efficiency features. If you want to get a quality replacement, consider investing in ENERGY STAR rated windows. You can check out a list of all ENERGY STAR rated windows on this Natural Resources Canada website. These windows comply with international standards in order to be considered efficient in different climate zones. In order to be considered efficient in Calgary, Edmonton, Regina, Saskatoon and Winnipeg windows must meet a minimum ER rating of 29 and a maximum U-factor of 1.40. To be considered efficient in Vancouver and Vancouver Island, your windows must have a minimum ER rating of 25 and a maximum U-factor of 1.60. 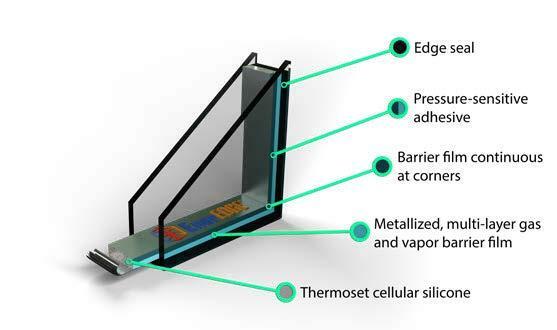 Low-E coatings, foam in the interior window frame, and Argon or Krypton gas fills can help improve a double-pane window’s performance and bring it up to the new standard. This, of course, has an effect on the window prices as well. Consider the purpose of different windows in different rooms. The side of the house that gets a lot of sun, for example, is more suitable for windows with higher Solar Heat Gains and lower U-Factor. The reverse is true about windows on the shady side of the house. Strategically planning which window to get for what room can go a long way toward saving money on your custom windows. While the table above is more of a general representation, as different Canadian window manufacturers carry different products, always be sure to ask about the differences in ER ratings across the different types of manufacturer’s windows. How much do triple-pane windows cost? This is the big question that can sometimes put homeowners off getting triple-pane windows. On average triple-pane windows cost 10-15% more than double-pane units. This may not be such a significant price difference if you are replacing one or two windows. But if you are removing old windows in the entire house, getting triple-pane replacements can add several thousand dollars on top of your already expensive project. Are triple-pane windows worth the money? If you read American window replacement websites, you will often see companies saying that spending extra money on triple-pane windows doesn’t make sense. This is actually true in a lot of the United States. What makes Canada different? Same thing that always did: our climate. Because the US has a much more temperate climate than most of Canada, a strong insulating barrier isn’t always needed in a window opening: the difference in temperature between the indoors and outside isn’t as big as it would be further north. There is no sure way to calculate how much more money triple-pane windows can save you. But. On average, it is said that triple-pane windows can help you save an additional 2-3% on your energy bill annually. In reality, that number greatly depends on the condition of your house, the wall structure, what temperature you consider comfortable, and even the condition of your furnace. To make the right decision see what your monthly heating bill is and use that as a foundation. Should You Get Double or Triple Pane Windows? Chances are if you are reading this post, you are on the fence about investing the additional money into your replacement. But it also probably means that you still want a solution that offers savings and makes your home comfortable. Before you decide either you want to install double pane or triple pane windows always consider your climate zone and the condition of other elements of your home. There are three Energy Star Climate Zones in Canada where the temperature becomes progressively colder from Zone 1 to Zone 3. South-western British Columbia and Vancouver Island are located in Zone 1. Zone 2 is southeastern, central and northern B.C., central and southern Alberta, southern Saskatchewan and the very southern Manitoba. Zone 3 covers the extreme northern part of British Columbia, northern Alberta, central and northern Saskatchewan and all of Manitoba except the very southern part. Not sure which zone you live in? Ecoline Windows offers double pane and triple pane replacement windows with professional installation services in Calgary, Edmonton, Winnipeg, Regina, Saskatoon and Vancouver areas. If you have any questions about our products, features and installation process please contact our support team. Triple Pane Windows vs. Double Pane: What's Better? Overall rating: 4.9 out of 5 based on 41 reviews.